Published July 19, 2016 By Anna T. This post may contain affiliate links. Regardless, I only recommend sites I've researched and/or used and trust. I have some information on another non-phone job for you today. Literably is a company that is often hiring work at home transcribers/scorers to listen to audio of elementary school aged children reading aloud. In this Literably review, I'll share with you how much Literably pays, who is eligible to apply, schedule information, and, of course, more details on what you actually do for the company. In order to fully comprehend what your job would be as a Literably scorer, you need to first understand the service that Literably provides to their clients. Literably's client base is made up of schools and teachers, and they pay for the use of Literably's classroom tools. These classroom tools make it easier for teachers to monitor their student's progress in reading since their software basically does the administration, scoring, and tracking part of the reading assessment process for them. All a teacher has to do is have the Literably software downloaded onto a desktop computer, and the students then read aloud to Literably. As a scorer/transcriber for Literably, your job is to listen to the audio recordings of the students reading and then transcribe (type out) the reading errors you hear the children make as they read aloud. The Literably job posting states that you can earn over $10 a hour. But, as is the case with these types of jobs, your actual rate will depend on your speed. It's likely that you may feel discouraged at first during the learning curve while you're going slow, but the longer you do it, the faster you will get. Some job postings for Literably state that you could earn up to $20 an hour, but my guess is that that won't be the case until you're very used to the work. To get paid for the work you do for Literably, you will need a Paypal account. You can work anytime you want with no set hours. 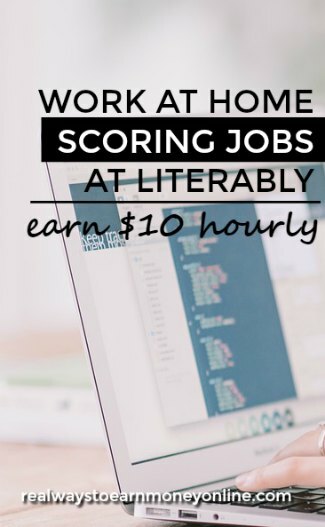 This is great if you're looking for a flexible work at home job that allows you to set your own schedule. Literably will have more work available to do during the school year, so this would not be a good job to depend on during the summer months for your income. Who Can Apply to Work For Literably? This company is open worldwide, so you can apply even if you are not US-based. What Is the Literably Application Process Like? This is one of those companies that doesn't have any strict requirements. If you can pass their preliminary test which requires you to score six sample recordings, then you'll be accepted and can begin working. Literably is currently hiring as of July 2016 in preparation for the upcoming school year. If you think you have what it takes to score for this company, then you can go here and get your application in. Good luck, and as always, please leave a comment below if you have any experience scoring for Literably. P.S. If transcription interests you but you're finding that Literably isn't a fit for you, you can check this huge list of 100 work at home transcription companies for other options. I also recommend this helpful eCourse for newbie transcribers who want to learn to do the job well so they can get in on better-paying work. Also I just recently got married and I am an artist (animator) to be exact. I know there are many places to sell art online but I was wondering if you would recommend any hourly paying illustration or drawing remote jobs. We just would like to earn about mininum an extra $1200.00 per month while we go back to school and start anew. Now is the MOST important time for me to find something that FINALLY fits my field or at least is artistically inclined. My husband and I have been following your site for YEARS!! Your site is VERY reliable. Thank you!!! We are working with an ESL company that reviewed. You can get a bluetooth keyboard for tablets. Check on amazon. Just a thought…. Great review of Literably Anna. I don’t think you missed anything here. I’m passing this information along. Thanks for sharing! Where is the link to apply? Under your HOW DO YOU APPLY section, you say “…then you can go here and get your application in.” Where you would normally have a hyperlink on the word “here,” it’s not there. No problem! Good luck if you try it! I cannot find a place to apply on the site. I used the contact us information. So it is wait and see. Thanks for the post Anna! Would you consider this an “egg” or could you work Literably, full time. Is there always work available like on a short task site like Amazon or are you working by the hour? Hi! I think that most of their work is available during the months that school is in session. Haven’t heard from anyone yet on how much there is to do. As with any independent contractor position, I probably wouldn’t recommend putting all your eggs here.